This site is the creation of Michael Kuo. With some exceptions, the site is based on my collections of North American mushrooms, made over the past 25 years, and the more than 1100 species pages here illustrate and describe these collections, along with collections that have been sent to me by others for study. MushroomExpert.Com contains no information about the edibility or toxicity of mushrooms. 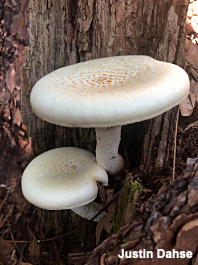 I think mushrooms are much more interesting, engaging, and important than figuring out what happens to humans who digest them—so you will need to consult other resources if eating mushrooms (or avoiding poisonous ones) is your goal. Would you like to get an email when new material appears at MushroomExpert.Com? Let me know and I will add you to the list! Identifying mushrooms is often much more difficult than identifying birds, for example, or trees. There are tens of thousands of species, many of which have not even been named! Comparing mushrooms to pictures is rarely successful. Instead, carefully studying the mushrooms (see the links to the right to get started) and using identification "keys," which ask questions to narrow down possibilities, is a more successful strategy. 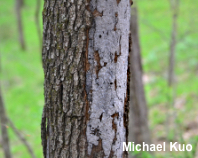 Identifying trees can be crucial for mushroom identification. For reference, I have made brief pages for the trees I am familiar with. I am incredibly grateful for the support of my readers. So many have donated over the years, in amounts ranging from a few dollars to hundreds, and many readers donate regularly. Thank you for your generosity! Donations can be made through PayPal, using the button to the right—or feel free to email me to ask about other ways to donate. My herbarium contains more than 4000 mushroom collections from North America (and a few from elsewhere). The herbarium database contains records for all collections. If you would like to contribute to the herbarium, please don't hesitate to email me. Many of this site's pages rely, in whole or in part, on well-documented collections that were sent to me for study; collectors carefully documented, photographed, preserved, and mailed their mushrooms. 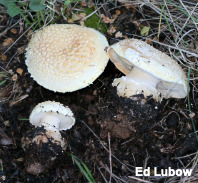 Examples include Pisolithus arenarius, Agaricus augustus, and Amanita westii. 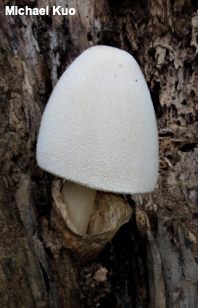 Be sure to visit midwestnaturalist.com, a companion site for non-mushroom natural wonders in the Midwest! A. sp. "Sand Dune Amanita"
A. sp. "Little Brown Amanita"
List of works referred to at this site. 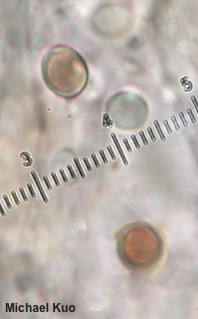 Key to the species of Crucibulum, Cyathus, Mycocalia, Nidula, and Nidularia in North America. 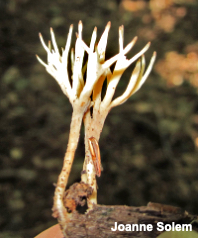 Common name for Apiosporina morbosa. 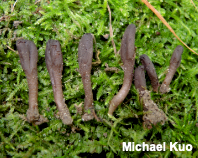 Common name for Craterellus fallax and related species. Common name for Clitocybe nuda. Common name for Agaricus bisporus. Common name for Sparassis crispa. Common name for Cantharellus cibarius and closely related species of Cantharellus. 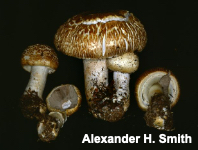 Discusses the use of ammonia, KOH, and iron salts in mushroom identification. Common name for Laetiporus sulphureus, Laetiporus cincinnatus, and other Laetiporus species. C. rutilus ~ = C. ochraceus. 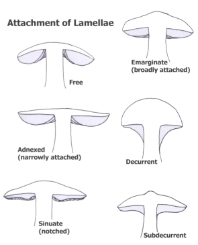 Genera treated: Ampulloclitocybe, Clitocybe, Infundibulicybe. Links to species pages; list of sources for club and coral identification. Methods & techniques for collecting mushrooms for study. 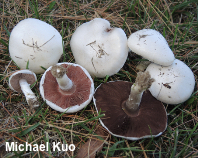 For many former species of Collybia, please see collybioid mushrooms. Genera treated: Collybia, Gymnopus, Rhodocollybia, Tricholomopsis, Flammulina, Calocybe, Crinipellis, Clitocybula, Callistosporium, Megacollybia, Xerula, and some of the larger species of Marasmius. Information about the site's regular contributors. Genera treated: Coprinellus, Coprinopsis, Coprinus, Parasola. For many species formerly known as Coprinus species, see the genera Coprinellus, Coprinopsis, Parasola, and the page for coprinoid mushrooms. 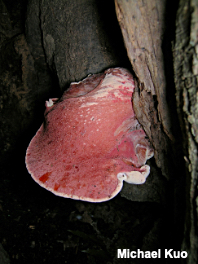 Definition and discussion; links to species pages; list of references for crust fungus identification. Definition and discussion; partial key; links to species pages; list of references for cup fungus identification. Common name for Xylaria polymorpha. 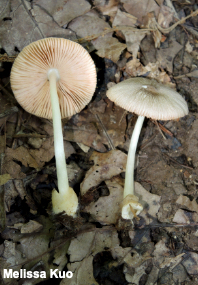 Common name for Pluteus cervinus. Common name for Urnula craterium. 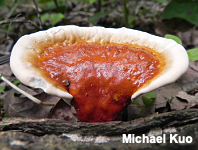 The cultivated, commercially marketed version of Flammulina velutipes. Genera treated: Clitopilus, Entoloma, Rhodocybe. Text corrections for How to Know the Gilled Mushrooms (Smith, Smith & Weber, 1979), How to Identify Mushrooms to Genus IV: Keys to Families and Genera (Stuntz, 1973), and The Boletes of North America: A Compendium (Both, 1993). Common name for Scutellinia scutellata. 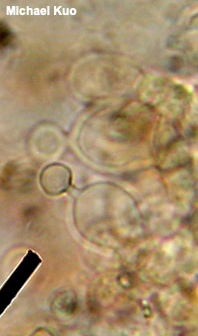 Discussion and illustrations of "fairy rings" produced by expanding mushroom mycelia. Common name for species of Gyromitra. 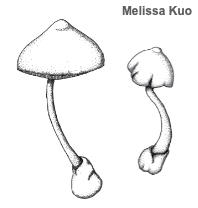 Brief definitions and illustrations of some mycological terms and concepts. Common name for Grifola frondosa. 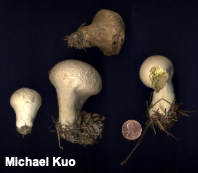 The herbarium of Michael Kuo holds many mushroom collections from across North America. Common name for Armillaria mellea and other species of Armillaria. Kuo, M. (2016). Regarding names published as taxonomic novelties at Index Fungorum. Common name for a plant--Monotropa uniflora--that is often mistaken for a fungus. 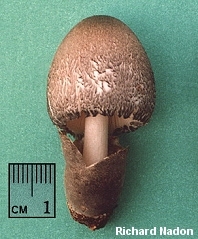 Common name for Coprinus atramentarius, or for coprinoid mushrooms generally. Common name for Omphalotus illudens and related species. Common name for Auricularia auricula. 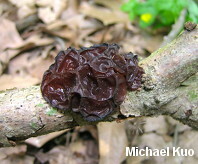 Links to species pages; list of sources for jelly fungus identification. 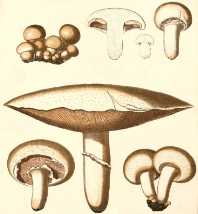 Information on describing collections in a mushroom journal. 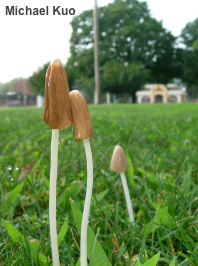 This site's keys begin with the Key to Major Groups of Mushrooms. 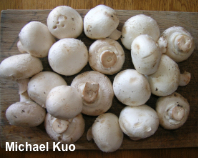 All pages at MushroomExpert.Com are written by Michael Kuo unless otherwise noted. L. xanthogalactus - see L. vinaceoruf. Mushrooms commonly occurring in yards and gardens. Genera treated: Chlorophyllum, Lepiota, Leucoagaricus, Leucocoprinus, Macrolepiota. Common name for mushrooms attacked by Hypomyces lactifluorum, a fungal parasite. Genera treated: Marasmiellus, Marasmius, Micromphale, Mycetinis, Rhizomarasmius, Tetrapyrgos. 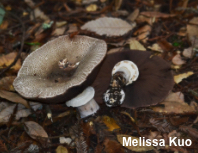 Common name for Tricholoma murrillianum and related species. Common name for Agaricus campestris and related species. Coltricia montagnei, Lysurus cruciatus, Lysurus mokusin: The Lantern Stinkhorn, Lysurus periphragmoides. 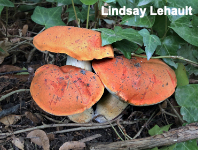 Common name for species in the genus Lactarius. A plant, commonly known as "Indian Pipes," that is often mistaken for a fungus. 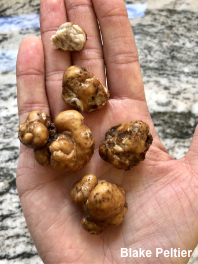 The true morels and the verpas. Key to the species in North America. 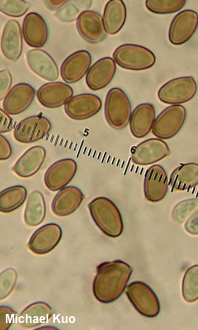 Disciotis venosa is treated separately. The MDCP, now closed, was a project that gathered hundreds of Morchella collections from North America; two scientific papers emerged as a result, characterizing our continent's morels. Key to 25 mushroom-eating mushrooms and fungi. An unscientific grouping of mushrooms that don't lend themselves easily to categorization. 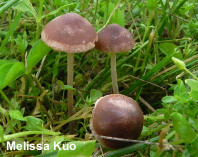 Common name for Strobilomyces floccopus and other species of the genus Strobilomyces. 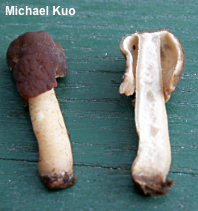 Small gilled mushrooms with pale spore prints, gills that run down the stem, and caps that are depressed by maturity; often growing on wood or associated with mosses or lichens. Common name for Pleurotus ostreatus and closely related species. See also Pleurotus populinus and Pleurotus pulmonarius. 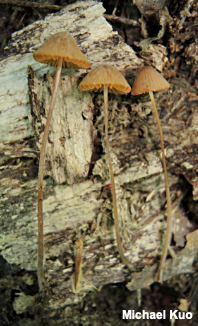 Gilled mushrooms growing on wood, with absent or rudimentary stems. Identification of poison ivy and related plants for mushroom hunters. Information on polypores, references list, Key to Stemmed, Pale-Fleshed Polypores, links to polypore pages. Common name for most mushrooms in the Polyporales. Information on preserving specimens for further study or for a herbarium. 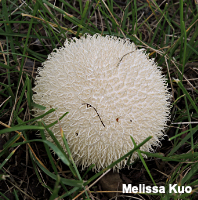 Links to species pages; list of sources for puffball identification. 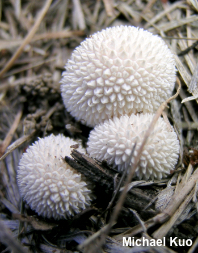 Explanation of citations at MushroomExpert.Com; complete source list; list of field guides, general interest, and beginning mushroom identification sources. 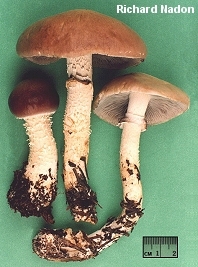 = Cortinarius. 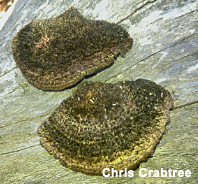 See Cortinarius caperatus. Common name for Coprinus comatus. 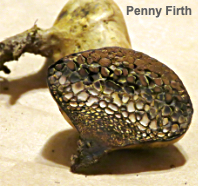 Information on creating spore prints--an important step in mushroom identification. See The Phallaceae and Clathraceae. 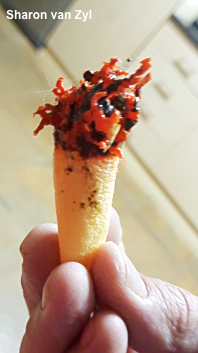 A research project investigating stinkhorns. 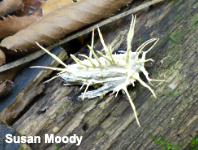 Key to the genera (and some species) of toothed or spiny mushrooms. Information on poison ivy and related plants for mushroom hunters. 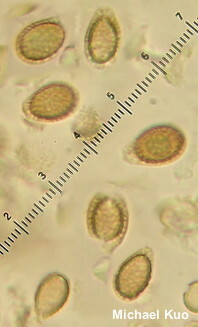 T. fulvum - see T. sp. 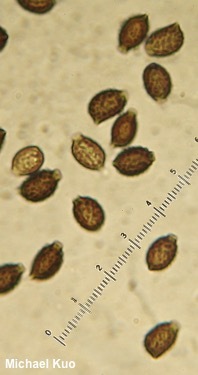 "pseudofulvum"
T. transmutans - see T. sp. "pseudofulvum"
Common name for Trametes versicolor and similar mushrooms. 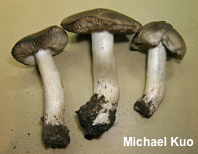 Common name for mushrooms belonging in several genera, including Hygrophorus and Hygrocybe. Common name for Tremella mesenterica. Common name for Hygrocybe conica.